There’s a certain weight to the way Paris sounds when you say it, even audibly, it’s luxurious. I booked a Friday plane ride to Paris the Wednesday before I went, and I’ve been itching to write about it. My trip to Paris began with me dragging my suitcase down Champs-Élysées in hopes to greet the Eiffel Tower with an insanely wide grin. 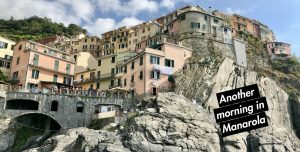 My stroll across the city, paired with a ham and butter baguette, reminded me that I was walking in a city that was nothing less than a masterpiece. I sat under the eiffel tower drinking the richest hot chocolate I’ve had in my life, feeding pigeons french fries while naming them. Paris in the fall, what a sight. I stayed in an airbnb that was neighbors to the Picasso Museum (I can’t believe I’m living a real life right now). It was a cozy studio nestled in an amazingly charming neighborhood not too far from Rue de Rivoli (I would recommend the 3rd arrondissement to anyone, although every Paris niche has it’s own charm). What to do during a weekend in Paris, you ask? Jardin du Luxembourg is gorgeous all year round, but in the autumn, it’s a haven. I sat in the grass of the garden surrounded by champagne toasts, children floating mini sailboats in the fountain, and a small crepe stand in the middle of a warm hue of fall leaves. While this park is a show stopper no doubt, there are a plethora of Paris parks that reside in the city– find them, frolic in them, drink champagne, write a future pulitzer novel. The park is your oyster. FREE museums. Yeah. 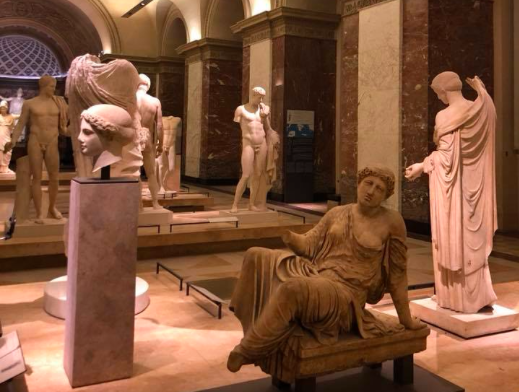 The Louvre is free Friday nights for anyone under 26, so you bet your bottom dollar I danced throughout the ancient art and statues (and said hey to the Mona Lisa) on a beautiful Friday night in Paris. 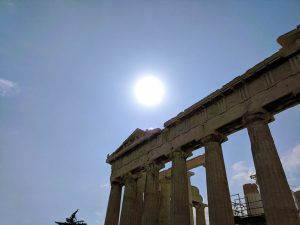 There are loopholes to getting into a multitude of museums for free (certain days of the month, certain times, package deals, etc), and if you do your research you’re bound to find something that suits your interests. Moules Frites – usually consist of a huge steaming pot of mussels cooked with butter, white wine, shallots, and herbs. They’re delicious and you’ll probably eat them all in like 2 minutes, but with a basket of fries to dip in the leftover cooking liquid, you have every component for a perfect meal. Bread – croissants. Baguettes. Get them in the morning when they’re warm. They will undoubtedly change your life. Cafe Noisettes – a perfect couple of sips of coffee with a hazelnut dollop of cream. An absolute delight. Looking for a specific spot to go? A corner cafe covered in flowers– how can you beat that? Café de Flore is famous for having famous writers and philosophers as it’s regulars. It’s really Paris, really charming, and really overpriced. I would recommend stopping for coffee, not a meal. I stumbled across so many amazing things in Paris, I can’t even count them. Spend your days in the city of love walking around it aimlessly, you’ll venture to a million picturesque places. London, London, London! What to say about London! One of the gloomiest autumn cities, but also one of the most gorgeous autumn cities I’ve ever seen in my LIFE. My first day in London was dedicated to no other than the classics: London Eye, Big Ben (although my view of Big Ben was his clock peering through construction pipes, but I saw him nonetheless), palaces, parks, oh my! I recommend skipping entry fees and just observing the feeling of the areas (unless your a Royal family fanatic, then by all means)– the London eye/bridge was hustling and bustling and, in my opinion, drinking mulled wine from a food truck and walking around was almost better than waiting in insanely long lines to get on the eye. While all of the touristy stuff is good fun, London is GIANT, and there’s so many things to do all over the city. Camden Market has over 1,000 shops ranging from dried fruit earrings to killer Chinese food. My venture to Camden Market was on a rainy morning- and I think it made my experience better. 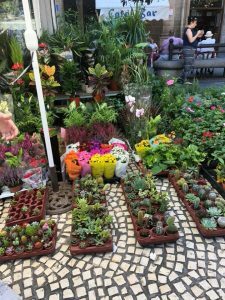 The market is both indoors and outdoors, with the best handmade goods, thrift shops, and food vendors. 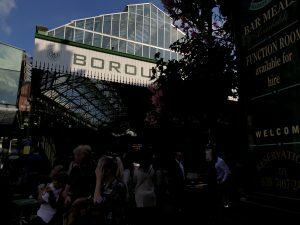 The market surrounds a canal that gives boat rides which makes it unbelievably picturesque, and regardless what spot you reside in Camden Market, you’re going to have an amazing time. *Tip– If you walk to Camden Market, theres a block of touristy shops that say “Camden Market’ above them- but that is NOT the market. You will see the canal and the black sign saying “CAMDEN MARKET COME IN WE’RE OPEN.” It clearly looks like a structured building and it’s hard to miss! 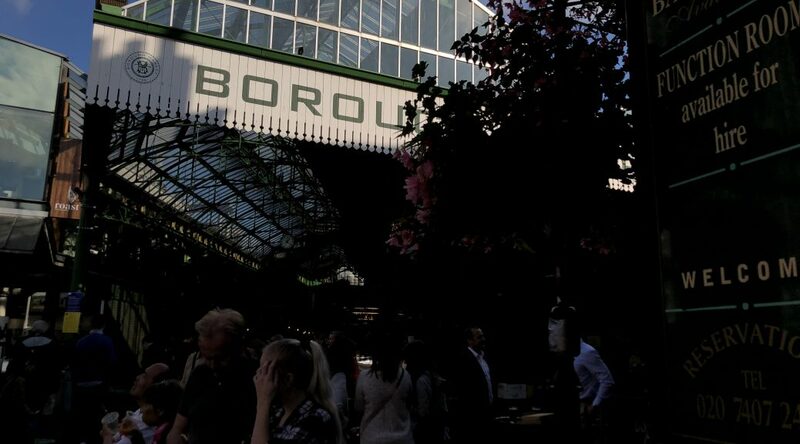 Borough Market- oh my god. If you’re not hungry when you walk in here, you instantly will be. This is a food market with both hot, prepared food and packaged food to take home (I came for lunch and was not disappointed). An amazing part about Borough is that almost every vendor wants you to try their product- It’s like, fancy London Costco. I was handed seafood paella, a steamed mussel, copious amounts of cheese, truffle honey, etc. It was a dream. My lunch was toast topped with sautéed mushrooms (simmering in a giant vat of butter) with herbs and parmesan cheese and a piece of roasted cheese- I’m drooling thinking about it. My motto for London, and every other place I visit, is to walk EVERYWHERE and honestly, not plan a dang thing. Of course, if you have spots you can’t miss, make a note to visit (reference to touristy London spots/markets- because it’s almost necessary to go), but not having a crazy scheduled day leaves you with the best gift you can have while traveling: the opportunity to stumble upon amazing things. Upon the realization that I was in London the same as the BFI London Film Festival (contact jbenkelman@luc.edu if you ever need research on a city), I made loose plans to be in the same area and possibly see a film. 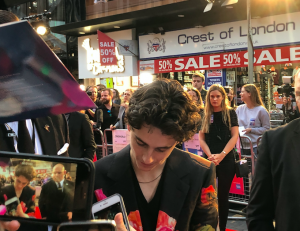 Long story short- I was standing about 2 feet from the Beautiful Boy red carpet and got stand by tickets to the premier. Truly didn’t feel like real life. Truly proved my motto to be true. Ginger Jules reminds me of a little woodland fairy house with the best gingerbread coconut chai i’ve ever tasted in my life. 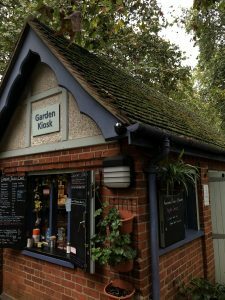 It’s a little garden kiosk in Gordon Sqaure, an old spot for famous writers, and when you walk up to the counter early in the morning you get smells of baked goods and sights of pre-lunch homemade soup preparation. It is vegetarian and vegan friendly and has a large supply of alt. milks (being a coconut milk enthusiast, I was over the moon). Due to the feeling of sipping a coffee and eating carrot cake in a leafy, earthy area, I became a short-lived regular. Let’s just say I will be dreaming of Ginger Jules. Half Cup is nestled on a side street near Tavistock Square, and usually has a line out the door. However, have no fear, because while you wait for breakfast you can sip something warm from the coffee bar (charcoal latte, maple chai, or caffe americano anyone?). 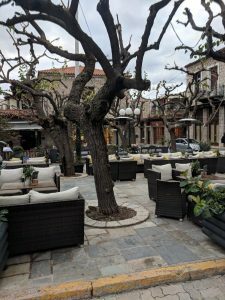 Both the indoor and outdoor seating is unbelievably cozy, and the food matches the mood. You can feast on traditional english breakfast or, my new favorite, parma ham pancakes (a short-stack of ham, pancake, and gooey cheese topped with a sunny side up egg). A little pricey, but worth it. Primark is just, simply, the place to be. Overall, London was jam-packed with good food, long walks, and amazing finds. I cannot wait to return. *Tip- to save money, book overnight busses to different countries (one less night in a hotel/hostel, no plane costs). It may result in a sore back, but hey, it gets you there. After 14 hours on bus, I arrived to sunny, smiling Amsterdam. Amsterdam is probably the most crazy beautiful place I’ve ever been. 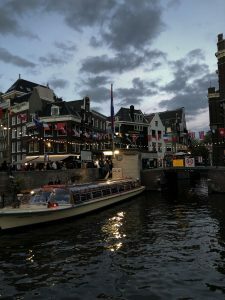 Even the best pictures of Amsterdam don’t do it justice. 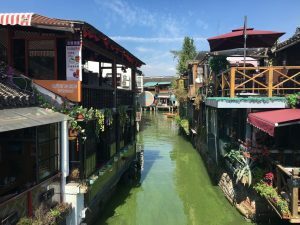 It was a tucked away haven of bikes, bridges, and leafy plants all rolled into one breathtaking city. My time in Amsterdam was very museum-heavy, but I wouldn’t have it any other way. I visited the Anne Frank House, the Van Gogh museum, and the museum of prostitution in the red light light district. If you can only squeeze in one of the three, I recommend the Van Gogh museum, due to the fact that it’s so big, so worth the entrance fee, and located in a museum campus (the museum lives right next to the modern art museum, so if you have a free moment and are in the area, you can check that out too!). It’s all around a wonderful area to walk around in after you visit. Also, the Van Gogh museum cafe provided me with zucchini, pea, and leek soup, and it most definitely changed the game of soup for me. Boat cruise! Boat cruise! Boat cruise! 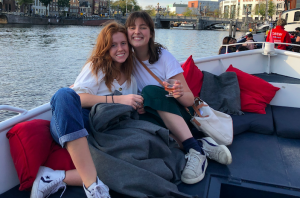 20 euros for over an hour drinking wine and cruising around Amsterdam- you truly can’t beat it. Amazing for architecture, amazing for meeting people, amazing for feeling like you are the royalty of Amsterdam. I don’t care where you get them. Find them. Devour them. They’re delicious. The perfect breakfast spot. 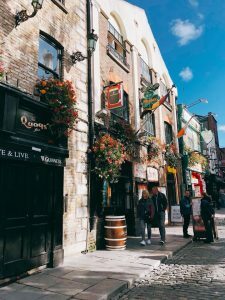 It’s nestled on a cobblestone street minutes from the city center and has the coziest feel inside. Build your own omelets are the thing to get; they’re soft and fluffy and come with salad and a huge piece of toast. It looks like water, it’s weirdly clear, but it’s so good? How do they do it? 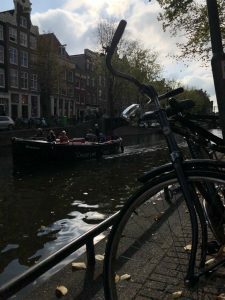 My biggest tip for Amsterdam is to explore outside the city center. Dam Square and it’s surroundings are sights to see for sure, but the outskirts are easily just as charming and are laced with beautiful parks and cutely curated shops. Don’t limit yourself just to the main part of the city! 13 hours in a bus go by and I arrive in Prague, or should I call it, Christmas town. Prague was seriously a magical wonderland. You could look out from any point on St. Charles bridge an see the most breathtaking landscape of warm orange trees. 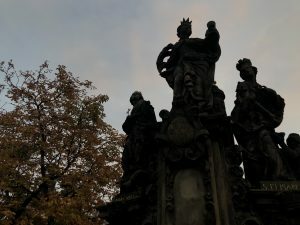 It was a pleasure just to look around in Prague– the air was crisp, there was an old, charming man playing accordion basically everywhere you went, and little street vendors with homemade art and jewelry decorated the town. It was the coziest place in the world without even trying; it was naturally warm and fuzzy. If you stay in the city center you are bound to find a plethora of things to do: boat rides that give you gingerbread and hot chocolate (I told you, Christmas town), gorgeous chapels that give organ concerts, market places galore (market place = chimney donuts = the place to be), weird museums (there is both a torture museum AND a medical torture museum, in case ‘torture museum’ wasn’t specific enough) and tucked away coffee shops. It’s just, a dream. I’m almost convinced Prague isn’t even real and I created it in my mind. SWANS. ALL OVER THE PLACE. There’s a spot on the water where swans and other birds just flock to greet you (or eat your food). It’s absolutely wild- bring some bread or veggies if you go. 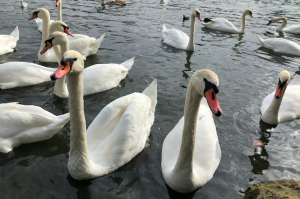 *Quick info on the Czech swans- they are so comfortable with humans due to their displacement and the destruction of their homes. They now rely on humans to sustain them, they don’t have natural resources for food or living space. While this is an exciting attraction, it also brings light to the anthropogenic impact we have on wildlife. If you go, bring food for them because they now rely on it (no processed goods, please) and remain conscious that these birds no longer have permanent homes because of us. 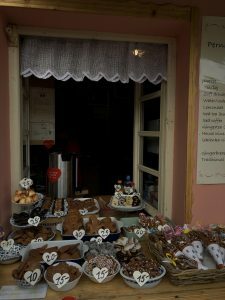 There are little huts of baked goods hiding all over Prague– they have mulled wine, hot chocolate, and gingerbread and coconut and chocolate treats! Quite possibly the best snack to have in Christmas town. This is a brand that is sold in many stores in Prague. It has the cutest, funkiest prints. If you are looking for souvenirs or something cool to remember your trip, I highly recommend. Buy a t-shirt, tote bag, stickers, or all of the above! I cannot stress this enough. Stick your head around, snoop a little, find breathtaking spots to take in for a moment. There is a boat dock near St. Charles bridge that you can’t get to, but there’s a lookout perched above it, and it looks like a painting. There is so much architectural and natural peace in Prague. I highly suggest you find it. Fall break, London, Amsterdam, Prague, you will be missed. Beans for breakfast and 14 hour bus rides, you will not be missed. Hidden gingerbread hut in Prague! Amsterdam, looking stunning as always. 9 Days. 8 Friends. 5 Countries. 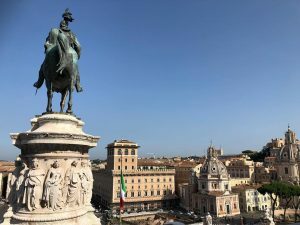 If you asked me before coming to the John Felice Rome Center that I would be able to pull off visiting 5 countries and navigate 4 different languages in 9 days, I would have never believed you. Over the past two months here (WOW time is flying by!) not only my confidence in myself has grown but also my ability to navigate foreign cultures has as well. Also, luckily for me, 7 of my fellow Alpha Delta Pi sisters were willing to embark on this adventure together. We set off on Friday for Vienna, Austria and ended in Barcelona, Spain by the end of the following Sunday. 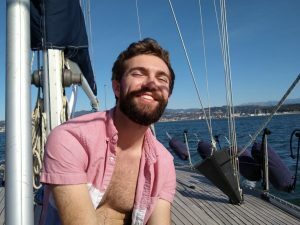 In-between those two countries, we took a day trip to Budapest, Hungary, stayed in Nice, France, and packed in another day trip to Monte Carlo, Monaco. Every where we visited, a different aspect of the local culture and architecture intrigued me. 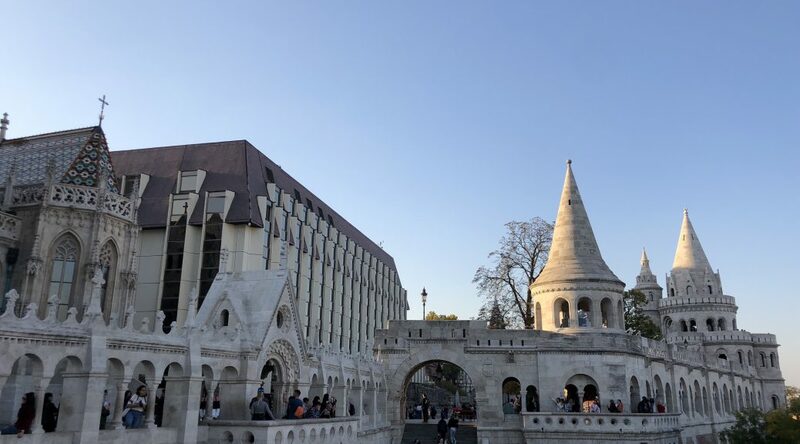 In Budapest, I felt like I was transported into a fairytale; whether it was peaking through the arches of their castle lined hill tops or the aroma of fresh apple strudel floating from tiny alleyways, I loved it and hope to return some day. 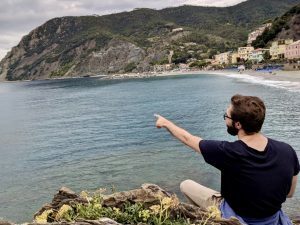 Taking in the aqua beachfront in Nice was breathtaking, and people watching from a cafe in Monte Carlo, ogling over the lavishly dressed locals, was a hoot. Undoubtedly, nothing tops the cuisine in Barcelona. We ate tapas after tapas as well as plenty of paella and Spanish omelettes, and even got to experience brunch again. There wasn’t a place I regret visiting, or an experience I wish I could have rather had over of my fall break. This trip was unforgettable, and what made it even more memorable was the life-long friends who were by my side. 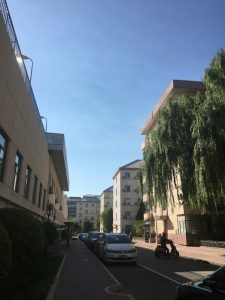 Since coming back from both the Silk Road and from whatever adventures we planned for ourselves during the Chinese National Holiday, all of us have been quite busy with schoolwork. We’ve come to the middle of the semester now. I’d be lying if I said that the semester hasn’t been flying by since the National Holiday. Midterms are this coming week, and many of us are spending this weekend preparing for them. As for me, I am a chronic procrastinator, so here I am writing this blog while my to-do list for this weekend stares mockingly at me. 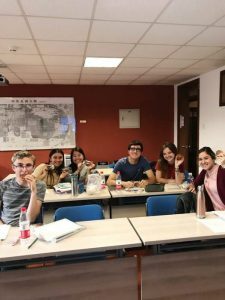 With the help of finally having an academic class schedule, life living in Beijing, China has smoothed out to a fairly rhythmic routine. I had thought that adjusting to the new environment around me was going to be more difficult than it has been. Every day has many thoroughly enjoyable moments that I share with my fellow TBC students and the TBC staff, and it makes life here in Beijing that much more interesting. The days seem to all blur together because they’re all so fun, and you know what they say about when time flies. As for my own academic schedule, I am currently taking 18 credit hours, so I’ve got a pretty full plate. Originally, I had planned on taking only 15 credits, but my sudden decision to switch into the intensive beginner Chinese language class has bumped those credits to 18. 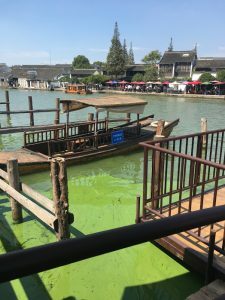 This hasn’t prevented me from going out and exploring Beijing or laughing with my friends in the TBC dormitory lounge, however. 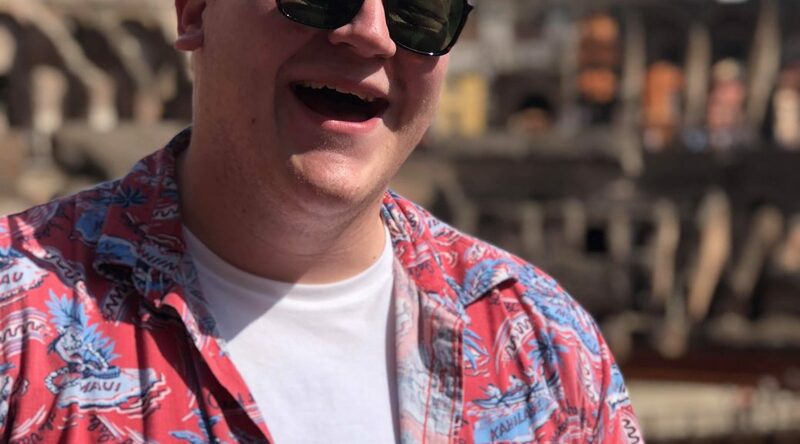 I love all of my classes because they provide a certain insight into Chinese culture and history that I couldn’t have gotten just by walking around Beijing. For example, I learned about the usage of Wade-Giles in my Modern Chinese Fiction class, a writing system that was used in China before the adoption of Pinyin. In Wade-Giles, if there was a “t” written, it was actually pronounced as a “d.” So, the original word for “tofu” in Chinese is actually pronounced and correctly written in Pinyin as “dofu,” but because people didn’t know about the difference between Wade-Giles and Pinyin when tofu was brought over to the West, it is now pronounced in the Western world with a “t.” How fascinating is that? It also isn’t hard to stay on top of all the schoolwork, so long as you make the effort to stay on top of it. A bonus is that all of the classes for TBC students are located in one building, so that significantly reduced the difficulty of university life here, much to all of our gratitude. In particular, I love, love, love, my Chinese language class. In the TBC program, everyone, regardless of their Chinese language level, are required to take a Chinese language class. I have never spoken a word of Mandarin before coming to Beijing, and I was very eager to start learning it formally in a classroom setting. 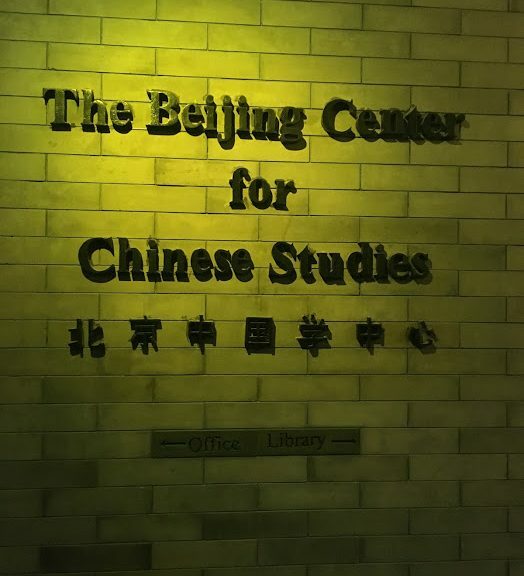 Like I mentioned before, I switched over to the beginner Chinese intensive class, which basically means that the class covers Chinese 101 and Chinese 102, or two semesters of Chinese, in one semester. 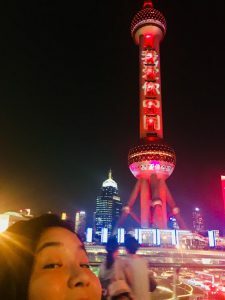 The pace that we’ve been going at is perfect for me, and I feel like I’ve been making leaps and bounds with my Chinese. 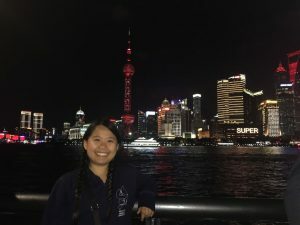 Just the other day, during pair work in class, I was able to make a pretty good conversation with my Chinese professor, and it was so rewarding to know that I’ve come so far in my studies when I had no background in the language before coming to China. In fact, I’ve picked up a Chinese language minor! In addition to having all of our classes in one building, they’re all located on the same floor, the 4th floor of the Ning Yuan Building, otherwise known to us students as the TBC Building. This is because the 4th floor houses the actual TBC center, with all the staff offices and the extensive TBC library as well as the classrooms that we students have class in. I can’t express enough how amazing it is for us students to have our own facilities and our own staff dedicated to helping us throughout our time here. Everyone is so, so friendly, and the friendly, welcoming, and warm atmosphere of the program has no doubt helped all the students, not just me, to settle into our lives here. I can pop my head into the Student Development Office at any time just to have a quick chat with the Student Development people. I’m so grateful for the support system here, through the staff members as well as my fellow students. My entire TBC experience would not be the same without any of the people I’ve made good friends with here, studying together, laughing together, stressing out together, eating together, and more. 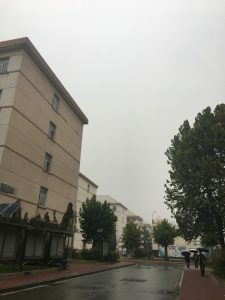 But finally, I’d like to talk a little bit about living with the pollution here in China. It really isn’t anything that is completely life-changing or life-altering. During orientation, we were advised to download an AQI (Air Quality Index) app in order to monitor each day’s air pollution rating, and I check this app every morning like I check the weather every morning. The app will give me a number index as well as a color to symbolize how bad the pollution is, with green representing pretty clean air (the number index ranges from about 0-90) and purple representing pretty bad pollution (an index of about 250-300). Basically, the higher the index, the more pollution there is for that day. A screenshot from the Air Quality app that I use. You can also see the color coordination that they give the different ranges of indexes. We’ve only had a handful of days where the air pollution has reached the nasty “purple” rating (I remember the rating reaching around 290 those days). 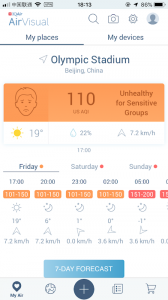 The great majority of days, however, are “orange,” or an AQI of around 100-150. The difference between these two air qualities are quite jarring, as you can see in the pictures I took just a day apart below. In terms of the water pollution, people just buy bottled water. Water here (including literally everything else) is really cheap (we’re talking maybe 30 U.S. cents for a 550 mL bottle of water and 40 cents for a 1.5 L bottle of water), so access to clean water is not a problem here. I will dedicate an entire blog post about the food I’ve been stuffing my face with while I’ve been in China — you will have to wait until then to hear about the details of the amazing food here in China! Trust me, it’s quite different from the Chinese takeout back in the States. What I will say that food, along with water, is really cheap as well. Most of my meals are around $2, and I usually won’t spend more than about $7 on food per day. Plus, because of UIBE’s amazing restaurants and street food vendors around off campus, I rarely get bored of Chinese food. But more on that later. So yeah, in conclusion, life is good! Homesickness is definitely a feeling that I get from time to time, I won’t lie, but I know that my time here will be over within a moment’s time, so I gotta enjoy it while it still lasts! Where in the World is Brandon?! Perhaps you know me, perhaps you don’t. I’m basically a living version of “Where’s Waldo” since I’m usually on a plane, bus, or train to somewhere around the world. This semester, I’m studying abroad at Loyola University Chicago’s John Felice Rome Center (JFRC). This is actually my third study abroad experience. 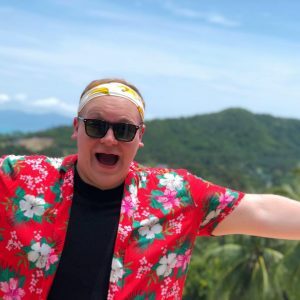 I spent my senior year of high school in Surat Thani, Thailand with the Kennedy-Lugar YES Abroad program, and then my sophomore year of college in Chiang Mai, Thailand with the USAC program. Since then, I’ve explored about 40 countries and picked up a few languages along the way. I guess you could say the travel bug infected me a little too hard! I am currently writing from Guelph, Ontario, Canada (say what?!). Since it’s fall break, I decided to spend the week here in Canada with my lovely partner. I am fully enjoying the beautiful & crisp air, vibrant leaves, sweater weather, and Halloween spirit that Rome sadly does not have. However, Rome has so many other things to fall in love with. It was pretty hard to leave for even just a week. all more than great, but I actually didn’t have much choice in where to study abroad. 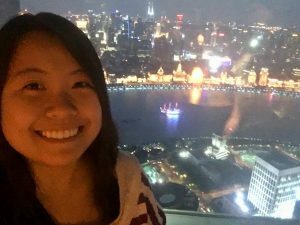 When I decided that I wanted to study abroad for a third semester, I jumped through several hoops in order to make it to where I am today. I knew I would need pretty specific courses to complete my degree plans since this experience would be during my last year of college. Thus, choosing a Loyola center (Rome, Vietnam, or Beijing) was my only option. I felt I had spent a lot of time in Asia respectably, so Rome it was. I will admit that I was not the most excited at first (I know! Hear me out). I am a person who thrives off adventure, the unknown, and very “out there” experiences. 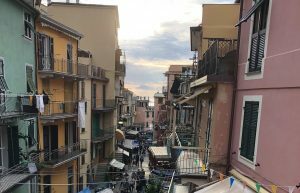 Rome felt “safe” compared to other possible study abroad destinations. 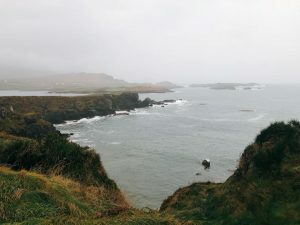 In a way, I had a vendetta against European study abroad experiences… I always believed there was so much of this world to see that Americans too hastily overlooked. 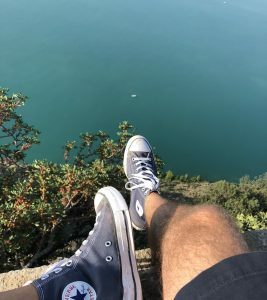 Once I was accepted to the JFRC, something sparked. It made my upcoming journey real. 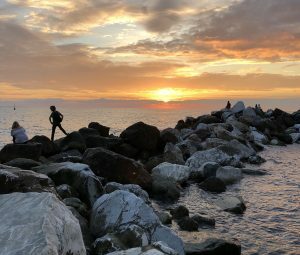 In the spirit of adventure, I looked at this semester as an opportunity to do what I love most: explore new countries, learn a new language, and make priceless memories. 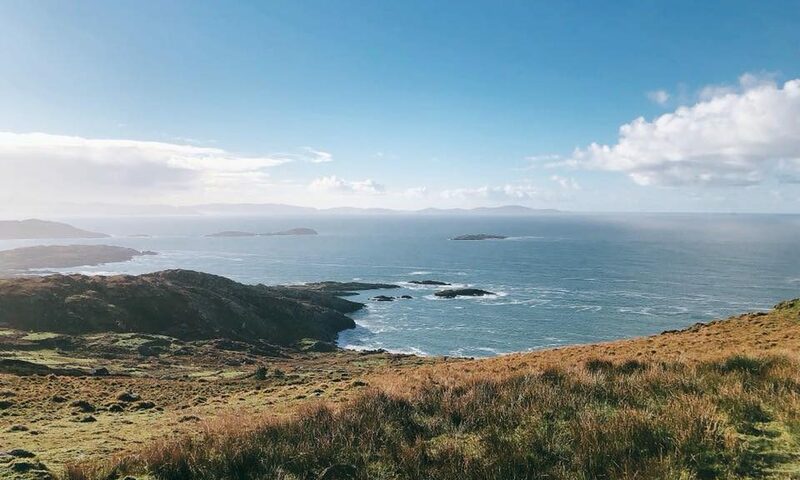 Any adventure is worth going on. And truth be told, I’ve been proven so wrong about Rome and Europe as a whole. 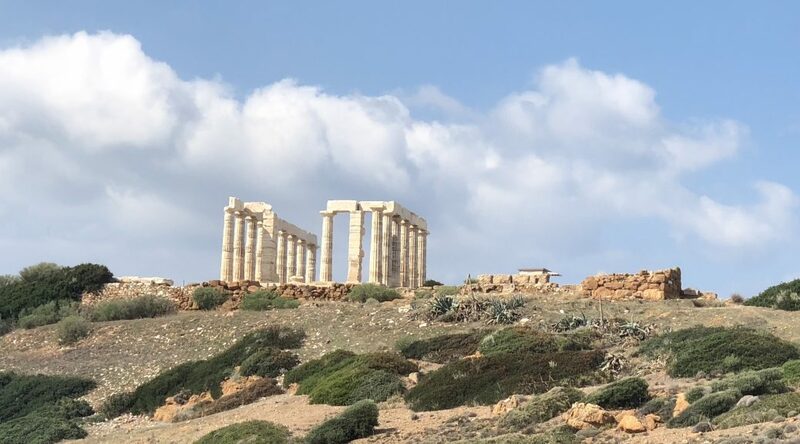 This continent is fascinating, and is so rich with history that there’s no possible way to learn it all. I started the semester off by leaving Chicago on August 10th. Between August 10th and the 29th, this was my travel path: Chicago –> Toronto –> Montréal –> Paris –> Copenhagen –> Malmö –> Bangkok –> Koh Samui –> Chiang Mai –> Kuala Lumpur –> Gold Coast –> Auckland –> Melbourne –> Los Angeles –> Chicago –> London –> Rome. My head hurts just typing that! Anyways, I found incredible flight deals that lead me to both familiar and unexplored cities. I connected with friends, ate awesome food, witnessed cool sights, and snapped the best pictures I could. Eventually I ended up in Rome and started this crazy semester. This semester, I am taking 6 courses. I am taking: Italian 1o1 (ITAL 1o1), European Masterpieces (LITR 200), Emperors, Bishops, & Barbarians (HIST 300 TP), Italy in the 19th and 20th Centuries (HIST 324), The European Union (PLSC 347), and Ethics (PHIL 181). So far, I feel as though I’ve been able to truly dive deep into European studies and learn quite a bit that I normally wouldn’t. 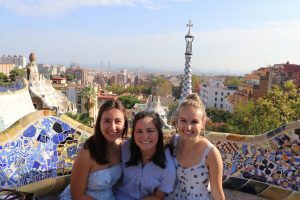 I highly recommend taking country/region specific courses during a study abroad experience! I would be lying if I said my favourite part of this semester WASN’T all the travelling I get to do on the weekends. 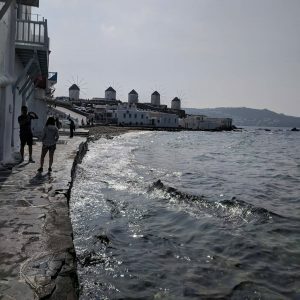 When a roundtrip flight to Morocco, Germany, Israel, or Turkey (or everywhere in between) only ranges from 20 to 100 dollars, why not take advantage of it?! So far, I’ve travelled to Romania, Turkey, Belgium, Netherlands, and Luxembourg. I guess Canada counts too ;). After Fall break, I have plans to travel to Austria, Hungary, Slovakia, Greece, Bulgaria, Morocco, Spain, Israel, Palestine, France, Germany, Portugal, Brazil, and Colombia (the last two are on my way home in December). It is so fascinating to bring to life all of the knowledge I’m learning in my classes. 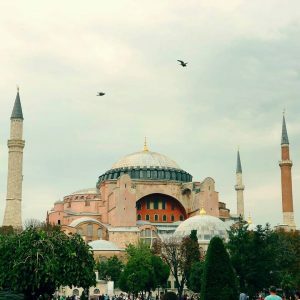 I wou ld say that Istanbul, Turkey is my favourite city I’ve ever visited. I think my next post will be dedicated to these awesome places I’ve been to. This post just can’t do them justice! I may have actually just lied. How could I forget the lovely friends I’ve made so far? Study abroad has a strange way of bonding you to new friends so closely, so quickly. It’s almost as if we subconsciously understand that out time abroad together is limited and that we have to soak up every minute of it. I want to give a special shout-out to Kaitlyn, Midori, Alyssa, and my uber cool roommate Bruno. You guys make everyday hilarious. 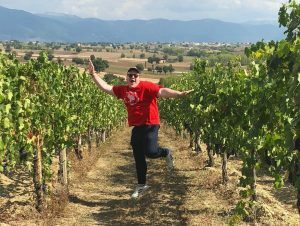 We’ve coined ourselves “the wine moms at the end of the hall” since we all live at one end of the hall of our hotel/dorm and highly enjoy the fabulous wine that Italy has to offer. They are my travel buddies, confidants, and joy makers. I love you, and I can’t wait for more adventures! That’s all for my first post. I’ll be sure to write soon. Thanks for following along! This past week was the Chinese National Holiday, so everyone had a week-long break from school and work (from October 1st to October 5th). 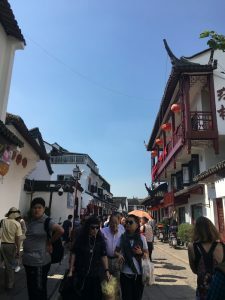 Almost everyone within my program went somewhere outside of Beijing for the long holiday, nicknamed the “Golden Week,” traveling in planned groups that were decided way beforehand. 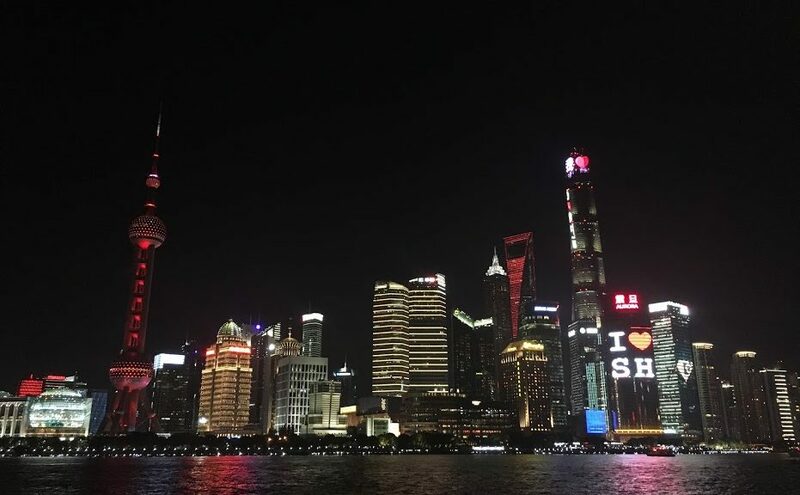 As for my friends and I, we decided to spend our Golden Week in Shanghai! We were a group of five people, which I thought was a perfect size. We five left for Shanghai on the Monday of the break at around 6pm. 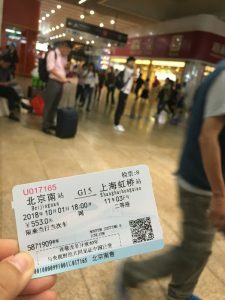 We took a bullet train to get to Shanghai because train tickets were way cheaper than airplane tickets. The train station was ridiculously crowded since quite literally everyone was going somewhere for the National Holiday, but we were able to plan accordingly and got to the station early enough to obtain our tickets, get some dinner, and then wait around for a bit before boarding our train. 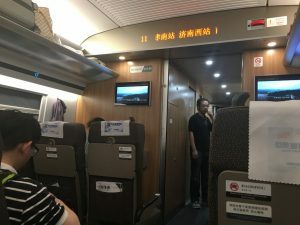 The actual train ride was very pleasant: it was a smooth ride (quite different from the overnight trains we took on the Silk Road!) and the inside of the train was very clean. 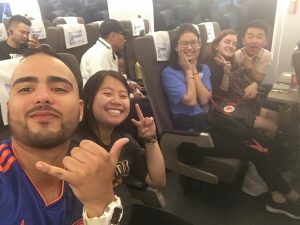 We were very pleased to find that everyone had plenty of leg space, which was one of the reasons we were glad that we decided to take a bullet train inside of a plane to Shanghai. We traveled an average of around 350 km/hr for about four hours before we arrived to our destination at around 10pm at night. The inside of the bullet train was very clean, and everyone had plenty of leg space to stretch out and relax during the ride, must different from an airplane ride! On our way to Shanghai! 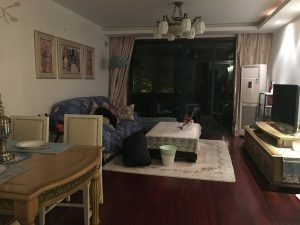 Once we arrived to Shanghai, we split into two groups and got into taxis that drove us to our Airbnb. I remember that taxi ride being ridiculously, and I mean ridiculously fast, almost hilariously fast. If there’s one thing I was impressed with, it was the speed at which our taxi driver drove in order to get us to our Airbnb. After we were dropped off, we were able to settle down for the night in our cute home for the next week. This is the bedroom that I slept in. 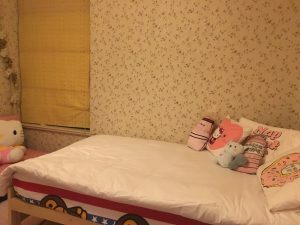 I shared the really cute bed with one of my friends. We were provided a TV with an HTMI cable and free Wifi, which is how we were able to put on Moana that first night. The table pictured is where we would play many rounds of countless card games at night when we returned from our daytime activities. That first night, even though we were all tired from the travel, we decided to put on Moana on Netflix and stayed up a little later than we probably should have before retiring to bed. 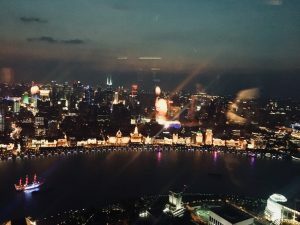 From here, I’ll divide our three full days in Shanghai into three parts by the day and talk about each day separately! The morning after we arrived in Shanghai, we woke up and walked to breakfast, enjoying the blue skies and the tall buildings of Shanghai. 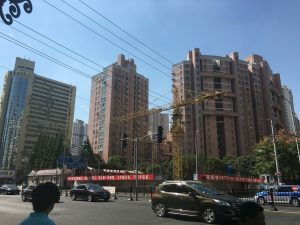 Walking around, I noticed that compared to the area around the UIBE’s campus in Beijing, Shanghai had more tall buildings. Looking at all the skyscrapers and tall apartment complexes reminded me of downtown Chicago, but the buildings were more spaced out from each other rather than being clustered together. 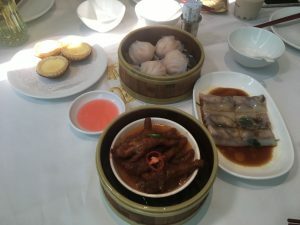 We had breakfast at a dim sum place, and the food was delicious. We ordered things like chicken feet, shrimp dumplings, egg custards, and BBQ pork buns. 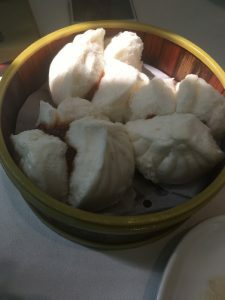 The BBQ pork buns were so soft and fluffy and filling, so they were my favorite part. The breakfast did well to fill us up for the day ahead of us! Them yummy BBQ pork buns! After breakfast, we took the train to our first activity of the day: the Shanghai Ocean Aquarium. The aquarium was so busy. And I mean, really, really busy. It was a kind of busy that I don’t think I’ve ever experienced before in an aquarium of all places. Think of Black Friday and then combine that amount of people with the amount of people in an amusement park on a given summer day. Then, shove all of those people into a relatively small aquarium. What you should get is people literally pressed up against each other as they shuffle along trying to get from one place to another. 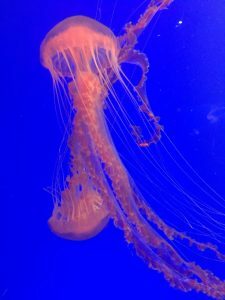 It was very difficult to get to the front of any exhibit or tank to see the organisms, and whenever we did, we were quick to leave the front on our own accord before we were pushed to the side by the crowd. 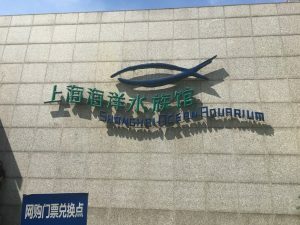 Going to the aquarium very quickly reminded us that we had come to Shanghai during Golden Week, where a lot of people come to Shanghai for vacation. But, aside from the really crowded part of the aquarium, I enjoyed it. Aquariums are one of my favorite places on Earth, so I was very glad that I was able to experience one here in China. 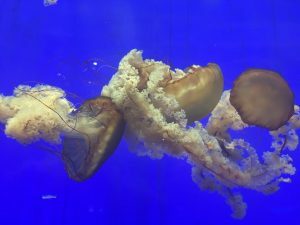 My favorite exhibit would have to be the jellyfish, since the aquarium had multiple very large tanks just filled with them. 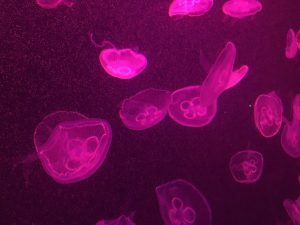 Seeing the different types of jellyfish float around aimlessly provided a temporary relief for little introverted me from the bustling loud crowd of the aquarium. After leaving the craziness of the aquarium, we still had half of the day leftover, so we decided to hang out inside of a large shopping mall nearby for awhile until night time. 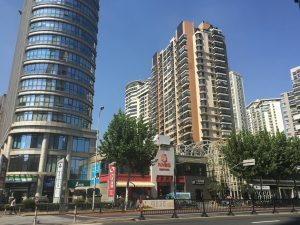 Walking over to the shopping mall, we enjoyed the sights of the buildings yet again, the most interesting one of them being the Oriental Pearl Tower which seemingly looked to be the centerpiece of the area we were in. 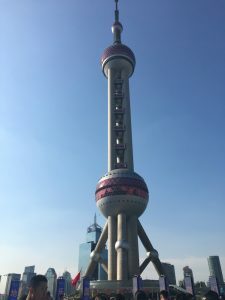 The Oriental Pearl Tower in the daytime. While inside the shopping mall, we wandered into many stores and looked at many clothes and goods to pass the time. The mall reminded me vaguely of Woodfield Mall in the suburbs of Illinois, only it had a ton of more floors and a lot more food places. It was in this shopping mall that I tried the trendy “cheese tea” that blew up on the internet for awhile. I can confidently say that it isn’t as bad as it sounds or looks! Cheese here in China seems to be more on the sweeter side and is commonly used in pastries. Because it’s sweeter, it paired well with the slight bitterness of the tea that was underneath the cheese layer on top. So I guess there was a reason why the cheese tea became viral for awhile! Once we had exhausted our time in the shopping mall, we decided next to go to a roof top bar in a fancy hotel. 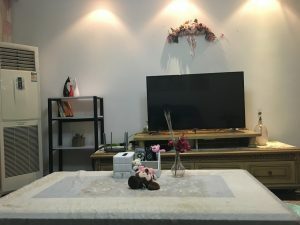 It was a relatively short walk from the shopping mall, and once we were inside the hotel, it was quite obvious that we stood out with our relatively casual clothes from the many dressed up guests. 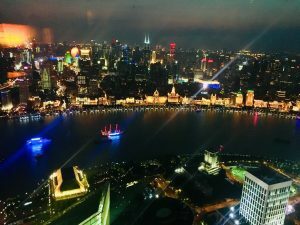 Despite this, however, we were able to get a really good table right next to the window, 58 floors high (I know, our ears were popping when we rode the elevator up to this floor), with a breathtaking night view of Shanghai. It’s self-explanatory that we spent most of the time taking classy photos with all the mood lighting and the gorgeous window view. 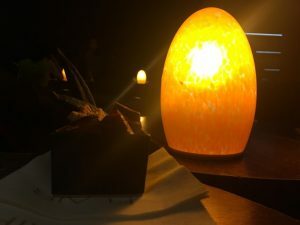 I sat back and breathed a relaxed sigh as I enjoyed the company of my friends and the lit up view from below. The little table lamp was used in many pictures to provide just the right lighting to many of our pictures. I thought it was hilarious to watch my friends manipulate this thing in order to get the right lighting. Do it for the Insta post, right? 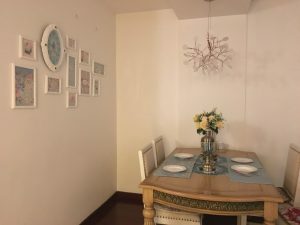 Once time was up for us at our table, we headed back to our Airbnb, where we listened to music and played card games well into the night before retiring to bed. The next day, we woke up more on the early side to get to our next destination in Shanghai, which was this “Old Town” area that had rivers running through the town. It was a neat place that had many street food stands on the sides of the small cramped roads that winded through the little town. Like in the aquarium, the location was quite crowded, and it was common that we were right up against people trying to get anywhere in the town. 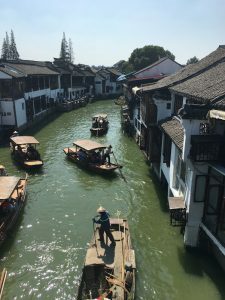 Regardless, though, we were able to enjoy ourselves and the nice weather, as well as the beautiful water-town-like views that we saw when we crossed bridges to get to another side of town. 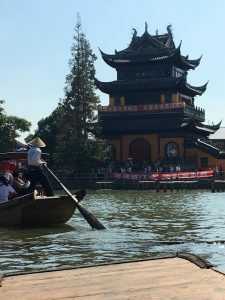 At some point, we got tickets to board one of those passenger boats pictured above and enjoy more scenery from the river’s point of view. 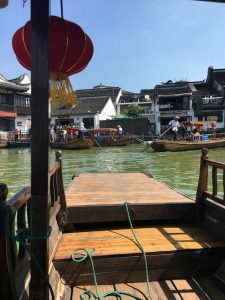 The boat ride was an experience in on itself: there were many times where our boat bumped into other boats, just because of the sheer number of boats filled with tourists on the river and the small width of some of the areas that we were taken into by our boatman. The boat also rocked from side to side to match the rhythm of the man who rowed us with a giant oar, so it was fun just to see the boatmen of all of the boats laugh at us nervous tourists. 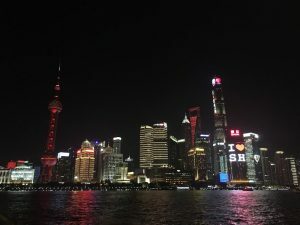 Once we had seen enough of that town and evening was approaching, we traveled all the way back to “downtown” Shanghai to see the famous Shanghai skyline at night time. It was breath-taking, to say the least. To see all of the buildings lit up brilliantly at night made me stare in awe. Of course, the area where you could see the skyline was, again, ridiculously crowded, but once we moved down a little bit, it wasn’t so bad. We were able to take some nice photos of that beautiful skyline and enjoy it while the night was still young. This photo doesn’t really do the actual view justice. At 5:30am the following morning, all of us rolled out of bed and got ready for perhaps our best day of the trip. Why in the world did we wake up at 5:30am, you ask? 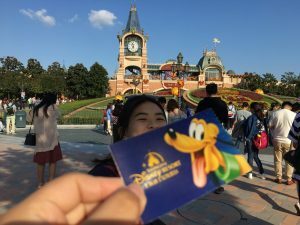 That’s because we were going to Shanghai Disney, and because it was Golden Week, we were all prepared to fight even more ridiculous crowds while walking around inside the park. 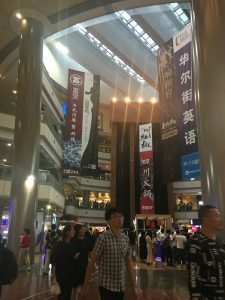 My expectation was a kind of crowded that was even worse than the crowds we had already encountered in the Shanghai Aquarium, so I braced myself. But, even before we could worry that, we had to somehow get inside the park in a timely manner. To do so, we woke up that early and got onto the train to the park pretty early. The park opened at around 8am, and our strategy was to get through right when Disney opened in order to avoid the early-afternoon crowd when we thought most people would be coming into the park. By the time we actually got off of the train, it was around 7:00 or 7:15, and that was when I witnessed the closet thing to a zombie-apocalypse. 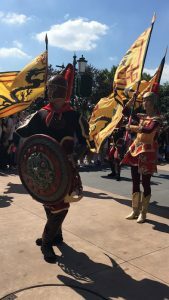 Literally, after we got off of the designated “Shanghai Disney” stop on the train, we saw the people around us either fast walk, jog, or sprint towards the entrance, trying to get ahead of everyone else by zig-zagging around them or even through them. Of course, we also ran as fast as we could to get as far ahead in the already long line for the security check as possible. I had forgotten of the amount of people who had the same mindset as us. 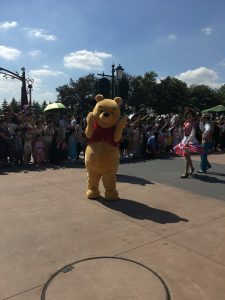 One of my friends had said, “For every person who passes you, that’s another person who’s in front of you!” I’m pretty sure everyone who was at the park that early in the morning had the same idea because almost everyone rushed to get in line. 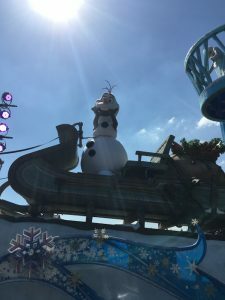 I’ve never went to any amusement park, let alone Disney, that early in the morning before, so maybe I’m biased, but I had never seen anything like that before. To say it was crazy would be putting it quite lightly! But after waiting in the cramped line for security for about half an hour or so and getting through the ticket entrance, we finally made it in! Excitement and pure childhood giddiness washed over me as we quickly walked out and into the actual park. 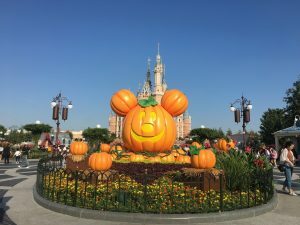 Complete joy filled my chest as I looked around at the Halloween-themed Shanghai Disney around me. 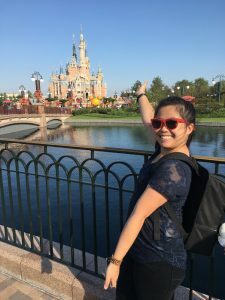 We walked down to that beautiful, giant, iconic Disney castle at the center of the park and proceeded to take just a handful of the countless numbers of pictures that we took that entire day. The moment was perfect — the amount of people who had already made it into the park had spread out so it looked like barely anyone was around. 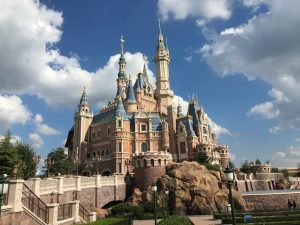 We were able to fit in about three rides or so before lunchtime, using the Shanghai Disney Resort App that we downloaded in order to best plan when to get in line for rides. That app was the best thing that we downloaded for that day because it allowed for us to finesse the lines and maximize our time at the park. By the time we were done for the day, we had crammed in about 8 or so rides, the majority of them being large major rides. Surprisingly, as the day went by, the park didn’t get any more crowded than any old regular amusement park. 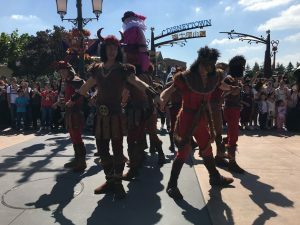 I had braced myself for something worse than the crowd that we had experienced in the aquarium, and pleasantly, we just got the usual Disney park crowd. 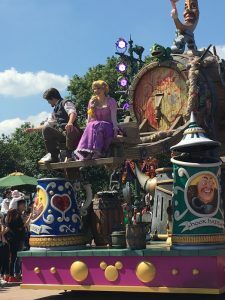 But after lunch, before we went on any more rides, we saw that the parade was about to start, so we stuck around for that, getting a spot right in the front. Because we were in the front, and because all of us girls were wearing these cute pink rabbit ear headbands that we had purchased the night before, a lot of the parade characters interacted with us! It was so much fun saying hello to the characters and for them to come up right to us and interact with us. You could say that it was a magical time! Once night fell and the park was nearly empty, we walked back over to that magical castle again and took some more photos of that magical view. 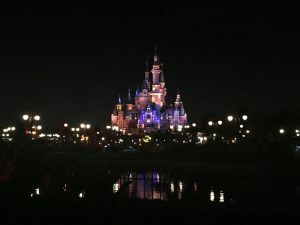 Our 16+ hours at Shanghai Disney was well worth the price that we paid for the tickets (and the sleep that we lost waking up that early!). 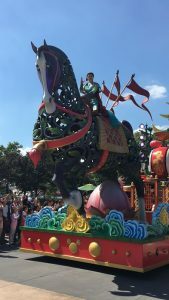 Being able to ride on as many rides as we did and just have a grand old time in Disney of all places was a perfect way to end our time in Shanghai and our vacation for Golden Week. 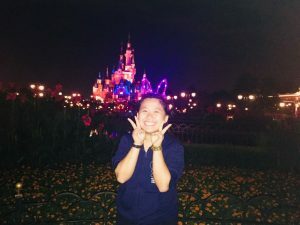 I was ridiculously happy to have gone to Shanghai Disney and have had a really great time there. To say that the past couple of weeks have flown by is an understatement. Almost a month ago, I completed orientation and arrived at my host house in Sevilla, Spain. My roommate and I were greeted by our host mother, and soon developed a friendship with her as she helps us improve our Spanish every day. 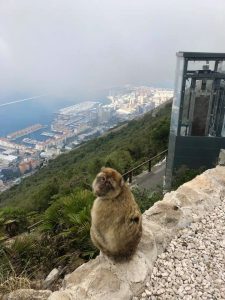 As far as traveling goes, my friends and I planned a weekend trip to Algeciras, where we enjoyed the beautiful beach and took a 30 minute taxi to visit Gibraltar, a British territory, where we hiked to the top of the rock and saw the only natural community of monkeys in all of Europe. The views at the top of the rock were spectacular, and the monkeys were very social with many of the tourists. 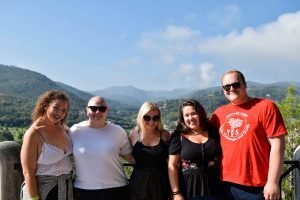 This past weekend, my study abroad program coordinated a day trip to Cadíz. On the way, we stopped in Santa Maria for a brief winery tour and tasting. 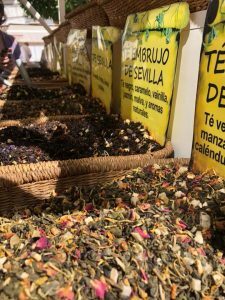 Upon arrival in Cadiz, we went on a historical walking tour of the main city and enjoyed exploring the beaches and open-air markets. 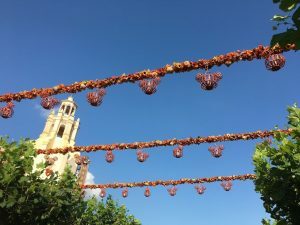 Aside from my travels to Cadiz and Algeciras, I have really been enjoying getting to know Sevilla! 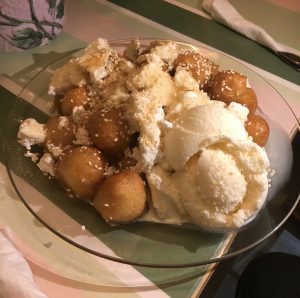 This past weekend, a nations fair opened and my friends and I had a lot of fun trying the food and dessert from other countries. I look forward to going to; France, Morocco, and Austria, however am trying to plan as many trips as possible while I am in Europe! One of the many monkeys we saw in Gibraltar. 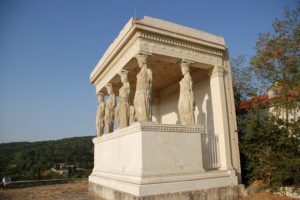 It was amazing how used to humans they are. We made sure not to feed any, but were told that they bother guests for a snack! Here, you can also see the view of Gibraltar and the Mediterranean sea from the top of the rock.